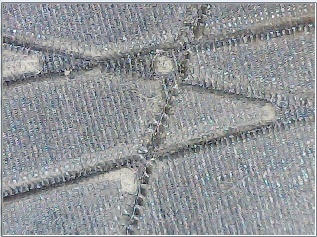 I sharpened an engraving cutter to a finer point, approximately 55 degrees included angle, instead of 90 degrees, with a clearance of 1/4 of a thousandth of an inch per 20 degrees rotation of the tool, with an initial clearance angle of about 13 degrees ( I hope I remember what I mean by all these numbers, so I can do it again ). The flat of the cutter was no more than 0.1mm diameter, which is dangerously fine. The material was aluminium alloy. Cutting time about 10 hours. 50mm/minute horizontal feedrate. 20mm/min vertical feedrate. The result was beautiful. I can't wait to see the impression it makes. I hope it doesn't get damaged in use too quickly, as it's not as hard as steel. 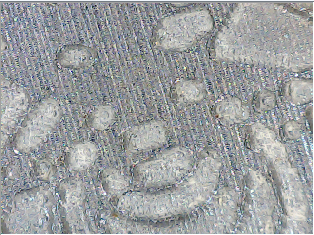 Interesting marks on the surface must be because of a lack of coolant; I couldn't stand there for 10 hours, so I just put some oily paraffin on the surface, but I guess it got used up or dried out while I was out at work. Bad news: Broke a cutter. Good news: Discovered that the steel I am using is much harder than some of the other steel I got. The cutter broke to some extent on the first couple of passes on all of the above attempts and got steadily worse from right to left. We have put the steel with ridges through the roller-press with some copper. It actually looks ok in most places. We need to modify the design though to make sure there are no areas with lines running nearly parallel too close to each other. It took almost 10 hours to machine this; 21:30 to 07:30. I was using a fairly slow feedrate; 60mm/min, 5000rpm. But we can see a problem where lines cross each other or get close to each other, the cutter can't get into the gap, because of the size of the flat. Maybe we could use chemical etching to make this? Instead of engraving grooves we wanted to engrave ridges! I found this simple way to create the toolpath with HeeksCNC. 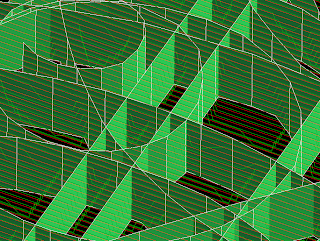 I drew all the ridges as sketches, made from lines. 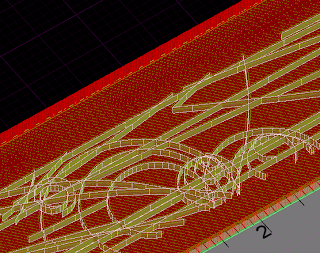 I extruded the sketches down, 1mm. I made a 3D attach operation and a zigzag pocket operation, specifying an engraving tool. Almost finished tidying the workshop.